Paul Walker in the first acting job of his career. When Hurricane Katrina cuts the power to an evacuated hospital, a father must keep his newborn daughter alive on a ventilator for 48 hours while trying to find help. 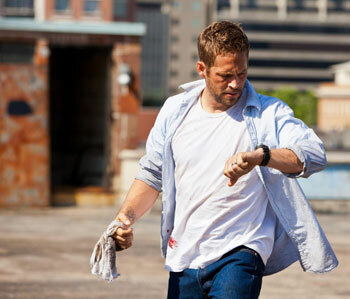 Walker is Nolan Hayes, an average expectant American father in New Orleans, who enters the hospital desperately keeping pace with the interns wheeling his pregnant wife (Genesis Rodriguez) in on a gurney as she screams in pain. The first intimation that Walker clearly Intends To Act is when the doctor brings news that his wife has died in childbirth. How hard must it be to assimilate such news? How much harder to act out this wrenching emotional rollercoaster believably? We wait with bated breath as Walker registers a mix of disbelief, anger, denial and pathos. That’s four more emotions than he’s ever shown onscreen before. — Wait. Am I in the right dimension? Is this the same guy from RUNNING SCARED and FAST FIVE? Still disbelieving that his wife has died, Nolan abandons the child to search for his wife. He finds a hallway full of corpses in bodybags, some on gurneys, some seemingly dumped on the floor, and… god, no!… his wife is on the floor. Movie is stacking the deck against us. We are weeping from the get-go. And so is Nolan, but – let me marvel over this truism – these are not Robert De Niro crocodile tears, Paul Walker is in a glass case of emotion as his real tears drip onto his wife’s bodybag. Now I’m weeping because Walker is doing such a great acting job! Then the power goes dead. Despite his alienation to this “it” in the ventilator, “it” is still a human fighting for life; an inbuilt species altruism kicks in and Nolan cannot abandon the baby. The emergency power kicks in at first, but it too goes dead, and Nolan finds a small generator to attach to the ventilator. He has to crank it every five minutes to keep it powered. Low battery, getting lower. Needs to find another – but he can only leave his baby’s side for 5-minute intervals. Nolan finds another dying battery. Two minutes with each crank. He cries heavy tears as he talks to the rubber dolly in the ventilator– wait, I’m only being truthful, you don’t think there’s a real comatose newborn baby in there “acting” on the brink of death? Everything Nolan does – runs the stairs to the rooftop looking for help, shouts down a helicopter which ignores him for a rooftop full of people, looks for food from vending machines or fridges, tries to locate a radio to call for help – he has to run back to pump that generator for two more frantic minutes. Not just a ticking clock – a ticking clock every two minutes. Thirteen hours later… exhaustion hangs like a suffocating drape around Nolan. Consider: How many more hours was he anxiously awake even before these hours, as he brought in his sick wife? His three-day growth fighting the four-day shadow that threatens to overwhelm him. He’s got that three-day growth at the beginning of the movie and 48 hours later he’s still got a three-day growth. Shouldn’t it be a five-day growth by now? We presume that when they find him, the first thing they’re going to do is operate and try to remove that three-day growth because it must obviously be an alien parasite. 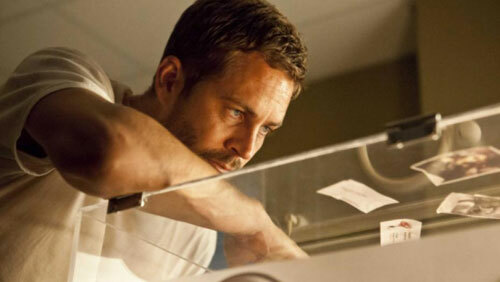 Starring: Paul Walker, Genesis Rodriguez, Nancy Nave, Shane Jacobsen, Natalia Safran, TJ Hassan.